As I have already observed on the entry for the Catholic church at Sheringham a few miles off, it is hard to conceive that, in these days when the Catholic church provides the largest single body of worshippers in England, the north coast of Norfolk had not a single worshipping Catholic community at the time of the 1851 census of religious observance. And, as I have also observed elsewhere, I always think that it must be difficult for English Catholic congregations to step out of their often small, undistinguished churches, into the shadow of the huge medieval churches that were once in their care. Catholic Priests ministered to the parish churches of England until the final break with Rome in 1557, but after that they fell into the care of the new protestant Church of England, and celebrations of the Catholic Mass became punishable by death. And yet, the glory that is St Peter and St Paul, the vast medieval church in the middle of Cromer, is out of sight to the Catholic worshippers here, because when Our Lady of Refuge, the first proper post-Reformation Catholic church in the area since the Reformation, was built at Cromer in 1886, there was such virulent opposition in the town that it had to be built out in the suburbs on the road to Overstrand. It is aptly dedicated. Of course, many other countries experienced the Reformation, or religious discords of their own kind, even wars, but only England sees its past refracted through the puritan fire of the 17th century. England is a nation which, for much of its early modern history, was virulently, even pathologically, anti-Catholic. In some quarters, suspicion remains even today. Be that as it may, the return of the Church to the north of Norfolk coincided with the rise of mass tourism in what was known as Poppyland. The railways opened the coast up to holidaymakers, and the big hotels were built to accomodate them. It was a radical change for these introverted parishes, which still seem so remote from London, barely 150 miles away. When the church was built, there was no resident priest at Cromer. The Diocese of Northampton provided a priest in the summer for the benefit of holiday makers at the request of Clement Scott, the inventor of Poppyland, and developer of the holiday industry in this part of Norfolk. The priest, from the church of St John the Baptist in Norwich, now the Cathedral, would arrive by train to say Mass, but in 1902 the increase in population led to Cromer, and thus north Norfolk, having its first resident Catholic parish priest for almost 450 years. As the Catholic church has grown in England, so the earlier churches have had to be replaced or greatly expanded. Nowhere is this more obvious than here at Cromer, where the 1886 church survives as the kernel of a great agglomeration of later extensions. The most recent of these was in the 1990s, when the hall and porch were added. 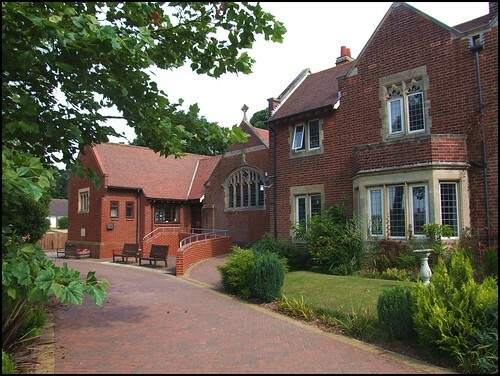 Our Lady is a sister church to Giles Gilbert Scott's spectacular church of St Joseph at Sheringham, with which it now forms a joint parish. In comparison, Our Lady is rather homely, even rustic. If it wasn't for the sign, you might not even recognise it as a church. Inside the red brick structure, the walls are painted Marian blue, the furnishings apparently acquired from two or three different sets. The post-Vatican II sanctuary is sparse and simple in comparison with that at Sheringham, but it contributes to the feeling of a light and loved interior, a suitable setting for the sacramental work of the church. A refuge indeed.